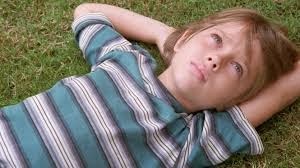 In 2002, Richard Linklater (BEFORE SUNRISE) cast a six year old boy called Ellar Coltrane to play a kid called Mason, who lives with his sister Sam (Lorelai Linklater) and his single-mom (Patricia Arquette). He filmed the kids hanging out with their charismatic but clearly immature father (Ethan Hawke), cycling round their neighbourhood and acting out when their mom wants to move back home and go back to college. Six years later and Linklater took up the project again. The kids are dealing with life with a new stepfather, stepbrother and stepsister. Their mum has gone to college and gotten her career back on track, but the marriage is bad and their father is still a distant presence. The difficulty of dealing with authority and life's sudden changes plays itself out. The kids have an attitude because they can't see the full picture. Fast forward another six years, and Sam has gone to college, and young Mason is on the verge of leaving. He's grown up now, but still growing - dating, excited and scared at the new life he's about to embark upon, sensitive and wise but still vulnerable and changeable. Meanwhile, his dad has remarried and grown up and his mum has realised she's an empty nester. This movie isn't just about boyhood, or childhood, but about how all of us come of age, mature and grow into and out of ourselves. It's about how our understanding shifts - the attitude we have as kids when we can't and shouldn't know the full picture about the adult choices shaping our lives. I've heard it described as an epic of the ordinary and that's absolutely right. This film is immersive and it feels like nothing and everything happens. We see a young kid grow into a lovely young man in front of our eyes. It's a kind of cinematic magic - more powerful than any CGI effect - because it's universally relatable. More importantly, because it reflects the reality of childhood in a world of put-together families and Sunday visits and step-siblings - a world of student debt, foreclosure, crummy weekend jobs and college dorm-rooms. There's also something refreshing about seeing real ageing on a Hollywood cinema screen, in a world where middle aged women are typically magically thin and well-preserved. Patricia Arquette is beautiful but ages. Not badly, but truly. It was a shock to see a woman who just looked like a woman - thicker waist and fore-arms, gently lined face, but still pretty and confident. For this alone, Linklater should be lauded. And for giving her the final emotional revelation - well, that's just a classy move. BOYHOOD has a running time of 165 minutes and is rated R. BOYHOOD played Sundance, Berlin and SXSW 2014. It is available to rent and own.